This page contains advice on the general care of items that you may have purchased from me, together with any relevant instructions. I am proud of what I make and endeavour to make all items to a high standard. Occasionally, however, something slips through the net – either because of unseen flaws in the timber or due to faulty craft parts. If you have one of my items that you believe is faulty, please get in touch and I will do my best to repair or replace. Timber is a natural product and its properties will change with its environment. In particular, it will react to changes in moisture content, swelling as it absorbs moisture and shrinking as it dries out. 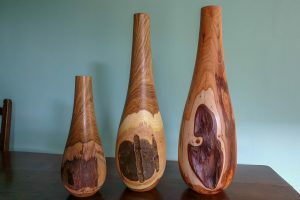 Occasionally I will turn green (wet) timber for bowls or vases, knowing that these will deform as the timber dries – it can give spectacular results! Mostly, however, I use fully seasoned or kiln-dried timber. which is at or near the moisture content I would expect in most homes. If left in direct sunlight, over or beside a radiator, or kept in particularly damp conditions (in a bathroom or near a cooker), then the timber will undoubtedly suffer. The colour of most timber will also change over time due to a slow oxidation process. 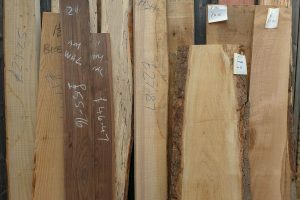 The extent of change will vary from timber to timber and some of the finishes I use will slow this process, but it is a natural process and there is little that can be done to prevent this gradual change. Some of the finishes I use will provide limited UV protection, but this natural change will be more rapid if the timber is left in direct sunlight. I tend to use wax finishes on most decorative items – pots, vases, fruit, clocks, and the like. The type of wax may vary, but the general care is the same. To maintain the lustre, simply dust regularly with a soft lint-free cloth. If the lustre fades over time, then it can be easily refreshed by using a paste wax (Briwax or similar). Apply a thin coat of the wax and allow to dry before buffing with a soft lint-free cloth. For a deeper shine, simply repeat the process a few times. Do not be overly generous with the wax, otherwise the result may be streaked rather than a uniform lustre. Waxed finishes do not like getting wet! If they get splashed with water, the result will probably be with white spots on the surface which are unlikely to disappear with a simple polish. You will need to rub back with some ultra-fine grade wire wool (most DIY shops), making sure you rub ‘with the grain’. The timber can then be repolished as above. An oiled finish is harder wearing than a wax because it soaks into the wood – it doesn’t just sit on the surface – and each coat chemically bonds to the previous coat. I tend to use this on my bowls that may contain food and on my salt & pepper mills that are to be handled a lot. I will use a minimum of 4 coats but on porous woods it will be a lot more. Although my bowls may be used safely for foods, please use some care. If used as a fruit bowl, remove any fruit immediately that starts to go mouldy. Many bowls are great for salads, but these are generally better left “naked”. If you do want to dress a salad, use an oil dressing and not one containing vinegar or lemon juice since the acid may affect the finish. Always use wooden serving utensils rather than metal ones that may scratch. If a bowl has been used for food, then clean it as soon as possible after use by simply wiping with a damp cloth and drying with a piece of kitchen paper towel. Do not immerse in the washing up water and definitely don’t put it in the dishwasher! That may seem obvious, but it would not be the first time that one of my bowls has been through a dishwasher cycle – the abrasive detergent took off most of the oiled finish and the bowl was saturated through. It did eventually dry out and I have since re-sanded and re-oiled it – almost as good as new, just a little staining. Assuming it’s not put in the dishwasher, then the lustre should last many years. If it does begin to fade, then it is easy to restore. The oil I generally use is Liberon Finishing Oil, which I find hard wearing and has the least effect on the final colour of the wood. However, Danish Oil is readily available in most DIY stores and is nearly as good. I have heard of people using olive oil, although I’m not sure I would recommend it – the finishing oils include chemical driers that mean the oil will cure to a hard finish. I am not sure, but I tend to think that olive oil (and vegetable oils) will soak into the wood and provide initial protection, but will eventually go rancid and possibly smell or contaminate any food. I suppose it may be OK if it’s done regularly. Whichever oil you use, the application is basically the same. Apply a very thin coat of oil with a small piece of paper towel or lint-free cloth (see warning below) and leave it to soak in for a maximum of 10 minutes. Then with a clean piece of cloth or paper towel, wipe of all remaining residue. It may feel as though you are undoing all the good that you have done in applying the oil, but some will have soaked in. If you don’t wipe it off, then it will take a long while to dry, may remain sticky and even prone to flaking. Leave to dry overnight and repeat if necessary. If you use an oil finish, then read any warnings on the tin very carefully, especially those about disposal of cloths. Depending on the oil, the cloth could spontaneously combust! Either rinse it out very well in hot soapy water or lay it out flat on a non-combustible surface until it has fully dried. All the mills that I make contain a quality “Crushgrind” mechanism with ceramic grinders manufactured by IDEAS Denmark A/S, which are guaranteed to last for 25 years. With a little care, your mill should last a lifetime. These will normally have an oiled finish and general care instructions are as noted above. Be careful not to get any oil into the mechanism, which is NOT removable. Simply pull the top of the mill off the central stem. This can be a little tight when new, but will eventually loosen a little. Simply turn the grey knurled knob on the bottom of the mechanism. Turning clockwise (tightening) will result in a finer grind, anti-clockwise will give a coarser grind. Be careful that the knob is not too tight, as excessive wear will occur if the grinders are touching. It’s about the only thing that will wear the grinders! You should not need to, but occasionally dampness will cause the grinders to clog. Undo and remove the grey knurled knob, bottom grinder and spring (don’t lose it!! ), then clean top and bottom grinders with a toothbrush or similar. On re-assembly, ensure that the spring is inserted narrow end first, followed by the grinder then finally the grey knob. These will normally have a waxed finish and general care instructions are as noted above. Do not use any polishes or solvents on the clock face or surround. You will need to remove the clock to change the battery or to adjust the time – so at least twice a year! The clock is a push fit into the housing, secured with a compressible silicone ring between the clock and the wood. Carefully prise the clock out from its housing using only fingernails. If the clock is too tight (and the housing is hand made, so some are tighter than others and it will vary depending on humidity), then use the blade of a blunt knife but only use the long edge of the blade so that no sharp edges lever against the wood. DO NOT use the end of a knife, or a screwdriver, as these are likely to damage the wooden housing. Remove the silicone ring to give access to the adjusting knob (pull out to adjust, then push back in again). To change the battery, you will need to prise the back off – or more simply take it to your local Timpsons or similar, just as you would with a normal watch. When refitting, note that the silicone ring is slightly thinner on one edge than the other. Ensure that the thinner edge faces the back of the clock and goes into the housing first. The rings on some clocks (generally the slightly larger ones) also have a slight thinning or necking for part of their length. If there is a thinner part of the band, then this should be located over the adjustment knob. Put the ring back on the clock first, and then push both clock and ring gently into the housing. Tip: I find it easier to align the clock face (get 12 at the top) by sitting the clock housing on a firm surface when refitting. As with the desk clocks, these will normally have a waxed finish and general care instructions are as noted above. Do not use any polishes or solvents on the clock face or surround. On most clocks, this is not necessary as the hole for the clock mechanism will be for the full thickness of the timber. This gives access to the back of the mechanism, allowing you to change the time or battery without removing the mechanism. If the back of the mechanism is not directly accessible, then it will have to be removed form its housing. This is a simple push-fit, held in with a rubber ring. If it does not pull out easily, then a slight twisting action can help. These automatically synchronise to the radio signal transmitted by the National Physical Laboratory, so no adjustment of time should be necessary. However, there are areas of poor coverage so manual adjustment may be necessary. Full instructions can be downloaded here. The finishes on these vary. Some are a hard wax, whilst others have a cyanoacrylate (superglue) finish. Both will wear with time and cannot be reapplied without disassembly of the pen or pencil, which is not always possible. However, as the finish wears, it will allow the natural oils from your skin to penetrate the wood and give the pen a natural patina. This will be a satin finish, rather than a gloss, but is equally attarctive and will reach a natural level. As with any timber, the colour will also change with oxidation. Refills for all are readily available at most stationers. Ballpoint pens are either Parker or Cross compatible. Leads are generally 0.5mm. These are generally made as decorative items in their own right, not necessarily to hold cut flowers. They can, of course, be used with dried flowers or grasses. With care, these can be used to hold cut flowers in water. Be particularly careful not to get the top of the vase wet when filling with water. The glass tube is a relatively loose fit in the vase. When supplied, it may well have some tape around the tube to make it a tighter fit so that it won’t fall out when customers turn it upside down. Remove this tape to make the tube easier to remove. It can then be removed each time you want to add water. If you do accidentally get water on the wood, then this can be restored as noted under ‘general care of waxed finishes’ above.